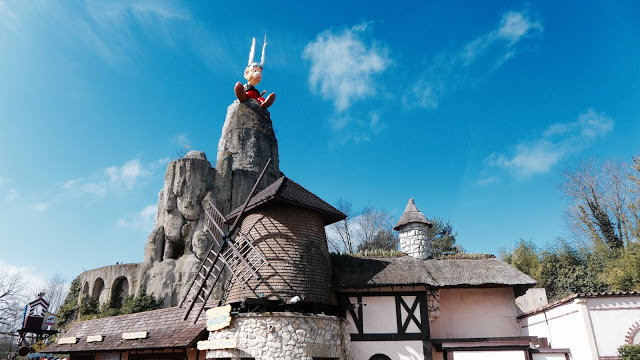 Trips to French theme parks can often be among the cheapest to do from the UK, and in that vein let's take a look at Parc Asterix. Parc Asterix is a theme park about 25km north of Paris based on the stories of Asterix. The park has been in operation since 1989 and is home to seven coasters including the CCI woodie Tonnerre de Zeus and the fabulous B&M invert Oz'Iris. Parc Asterix is conveniently located about 15 mins away from Charles de Gaulle airport, but for the sake of argument I'm going to include travel from Central Paris via the Eurostar and driving over using the ferry too so you can get an idea of options. So you have two options when it comes to flights. Your first option is from London Luton, leaving at 7PM and arriving at CDG at 9.25PM and returning to London Luton the following day at 9.55PM from CDG. Option two is flying from London Gatwick to Charles de Gaulle. These flights are a little bit later, leaving London at 9.10PM and getting into CDG at 11.30PM. Your return with this one is a little earlier, leaving CDG at 8.10PM and arriving at LGW at 8.20PM. There's only a £2 difference between these flights as I'm writing this, flying in June, so it's just a case of choosing which airport is most convenient for you. The cheaper option is £59. As the airport is so close you can easily get a taxi to the park for which a return trip will cost about £50. Alternatively you could hop in an Uber, and if you use the code ASTERIX10 you can save €10 on your journey! Usually for trips to France, Eurostar Snaps are the best option here. However as you can't select your time of travel with these they don't really work as an option here. Looking at the same dates as the flights, the cheapest Eurostar from London St. Pancras to Paris Gare du Nord at convenient travel times, works out at £134.00 return. At the time of writing there's a special offer going on with Direct Ferries, so a return to Dunkirk from Dover is just £49.00 which is obscenely cheap! Of course on top of that you have to include your petrol, which depends entirely on your car. It's about a 500 mile round trip from Dunkirk to Parc Asterix, which is roughly around £90. As always, Booking.com is your friend here. Parc Asterix do have on site accommodation that looks lovely, but we're here for cheap and cheerful, not luxury, so we'll save that for another time. A quick search for hotels near Parc Asterix of rating 8 or more shows Chambres d'Hotes L'Alezan for £52 including breakfast. Unfortunately Parc Asterix are kind of renowned for being on the more expensive side of park tickets without many options for savings. That said, if you're lucky enough to be aged 15-25 they do a special cheaper ticket which is roughly around £26 with the exchange rate which isn't too bad! If you're older then I'm afraid you're looking for at £34. Of course, if you don't mind an early morning or a late finish, you could save yourself the hotel and just visit as a day trip!